Oops! Yes, our site was down for a day. The site somehow stopped updating on various blog rolls and was stuck at a post 2 months ago. A little messing about behind the scenes and and we got the dreaded 404 error. Maybe the updating is fixed ... maybe not. For now, we're back up and running! We tend to use people’s real names, pick sides and jump into the middle of Laser politics, and even hang our dirty laundry out for the world to see. We are improper. However, we attempt to redeem ourselves by only pointing to Proper Course. 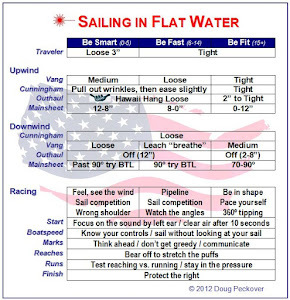 There you will find the jumping off point to all the great sailing blogs as well as a blogger who has been doing it the right way for a very long time. Proper Course is the yang to our yin. We are grateful that Tillerman was such a good sport about us sort of stealing his blog name. The Improper Course blog officially began 4 years ago during the Florida Masters’ Week on February 12, 2012. Doug was away (like he is now) and I was at home alone and bored (like I am now). His first post was his lessons learned at the 2012 Florida Laser Masters Championship. He said he was doing ‘horrible’ with a 9th place and had ‘tipped more than anyone.’ There were 42 competitors. By the third event that week, he finished 1st. One of my first posts was Masters Week - The Rest of the Story. The first time I ever heard Doug’s name, I was told a story about how just after he won the Masters Worlds, he was on the docks of his home club showing off his trophy. Meanwhile his Laser was behind him and had untied itself and sailed away. And that is Doug. Just a big doofus who makes mistakes like all of us and yet he somehow manages to do pretty dang well. It’s hard not to feel that if Doug can do it, then so can I.
I found that Doug was more than willing to share everything he knew with anyone that wanted to know. 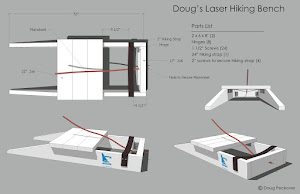 We had been writing for the Butterfly Fleet 20 blog but it was hard to justify adding Doug’s favorite subject, all things Laser, to a Butterfly blog. I found ways to add it but eventually decided to do a spin off blog and moved the Laser focused posts and started Improper Course. That way I could also publish all his Worlds Journals which I found fun to read. And the rest is history. Literally, his story. Doug likes to refer to the blog as simply being love letters between the two of us. It sort of is. It is our common ground and we do speak a different love language than most. My second post was a Valentine’s Day poem that I wrote since Florida Masters Week means being apart for Valentine's Day. I still wouldn’t have it any other way. Doug was in 4th place at the end of yesterday. Today, he's already moved down to 6th. That man just does not listen to me. I specifically told him to move up and not down. Oh well. He's having a great time I'm sure. Yesterday was light and today was supposed to be heavy. Doug is using the old sail and many are using the new sail. Will be interesting to see if the results show one sail to be better than the other. Proper and Improper Fractions! 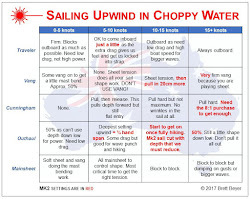 Never thought I would see that on a sailing blog. And then of course there are Rational and Irrational Numbers. I like to think I am a fairly rational person but a lot of the stuff I do when I am sailing my Laser should be classed as irrational. Should I change the name of my blog to Irrational Numbers? Of course, Course sounds like Coarse. Sometimes I am a bit improper on my blog and sometimes a bit course. Maybe I should rename it Improper Coarse? No, that would be too confusing. Anyway, thank you for all your kind words about my blog. I just checked the results for the Laser Masters Midwinters and it looks to me as if Doug is First Great Grandmaster in the Laser Full Rig fleet. Awesome! Good luck to him in the rest of the week. Hmmm. Maybe Good Look would be an appropriate name for my blog? Thanks Tillerman. It was windy for the second and third days and I slipped to 13th place... lots to work on before the next Master Worlds in May. Of the 59 competitors, Al Clark was the only one to sail consistently and he won by 17 points over current GM World Champion Peter Shope. I'll try to corner him to get a video interview on how he handled the surprisingly big shifts. It was not unusual to get a good start and be in the 30's two minutes later.